Gulfstream’s new 5,200-nm G500 arrives at ABACE this year as a certified aircraft, while its 6,500-nm sibling, the G600, is on the final stages of certification. Gulfstream will have both on display at its stand (SD11) this year, alongside its suite of its in-production models that also include the G280, G550, and flagship G650ER. The G500 received U.S. approval in July 2018. Gulfstream delivered the first of the model on September 27, 2018, and through early March had delivered 10 of the type. The manufacturer was in the final stages of receiving European approval of the ultra-long-range aircraft as well and has applied for Chinese certification. That certification process is anticipated to take about two years. Once the aircraft is certified in the U.S., Gulfstream will seek Chinese approval for the G600. Gulfstream anticipates U.S. certification within the next few months with deliveries following later this year. “We're very near the end of flight test,” said Scott Neal, senior v-p, worldwide sales, noting that by early March the flight test program had accrued close to 3,000 flight hours in more than 790 flights. Gulfstream was working to wrap up flight-into-known-icing and function-and-reliability tests, leaving primarily paperwork to complete after that. On flight into known icing, Gulfstream was down to the final data points in early March, added Catherine Downen, director of advanced programs, G600. The G600 program shared much of the same data as the 500, since the 500 is the base type certificate for both models, she said. The G600 was particularly able to benefit from the shared data in a number of aircraft systems. But the G500 and G600 have different wings, which necessitated separate aerodynamics testing, she said. In lead up to certification, Gulfstream has been making preparations for a smooth entry into service. Everything is ready to go on the production certificate, Downen said, adding the company anticipated it coming as certification is granted. Gulfstream was awarded G500 type certification and production approval on the same day. In addition, work is under way for interiors supplemental type certifications for the large G600 cabin. Entry-into-service work also includes flying a fully outfitted model to test all the interior systems at altitude. Two simulators are already in place with FlightSafety for the G500. Since the G500 and G600 have identical flight decks, the simulators can be shared. Both models are equipped with the Honeywell Primus Epic-based Gulfstream Symmetry flight deck with touchscreen displays and fly-by-wire with active-control side sticks. Collin Miller, newly appointed senior v-p innovation, engineering, and flight, said the G500/G600 program benefited from the Gulfstream G650 fly-by-wire technology. Calling the system on the G650 a big step forward, Miller added, “The flight controls and the way we did that set the stage for partnering…with the side stick.” The fly-by-wire technology also facilitates other safety enhancements such as high-speed protection, he added. Both are equipped with enhanced vision system (EVS) and the G500 was the first in the Gulfstream lineup to receive approval to use the EVS to land. They both will be certified for steep approaches. The G500 is equipped with 15,144-pound-thrust Pratt & Whitney Canada PW814G engines, while the G600 has 15,680-pound-thrust PW815GA engines. Both have an MMO of Mach 0.925, the same as the G650. The aircraft not only meet Stage 5 noise standards but also benefit from quiet technology that has been developed with the help of submarine acoustic engineering expertise from its parent company General Dynamics to help design that quiet environment, Miller said. “We work hard to give our customers back time,” Miller said. This not only translates into speed but also a requirement for the G500/G600 program for the ability of the customer to walk up to the airplane that has the door closed and no power and taxi in 10 minutes. 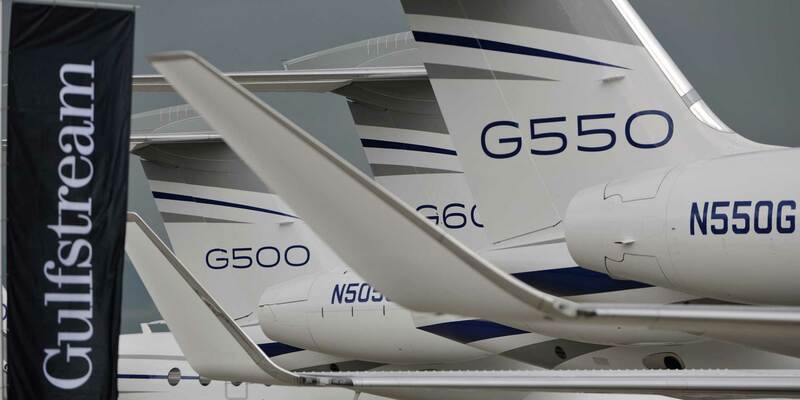 Gulfstream injected multiple technologies in the G500 and G600 programs, such as a data concentration network. A primary difference between the G500 and G600 is cabin length. Both can be fitted for 19 passengers and feature 6-ft, 2-in high and 7-ft, 7-in wide cabins. But the 600 has a 45-ft, 2-in cabin length, while the 500 has a cabin that is 41-ft, 6-in long. “We think the G500 and G600 can do extremely well in China because of the cabin size, the range, and the speed. And then the technology in the cockpit is just second to none,” Neal said. He believes that response will be even greater with the demonstrators on site. The Savannah, Georgia manufacturer took both of its new models on a multi-city world tour last year, and that brought in significant attention. “We sold quite a few airplanes because of the tour directly,” he said. Gulfstream now is focusing on the airshows and conventions with private showings in between, and Neal said the models already are solidly booked throughout the year. China, along with the Asia Pacific region as a whole, has become a key market for Gulfstream. Over the past five years, Gulfstream has experienced a 24 percent fleet growth in the Asia-Pacific region, the highest of all the regions, with growth in Greater China reaching 35 percent. The Asia-Pacific region has grown into the second largest market for Gulfstream next to North America, now reaching 340 aircraft, with more than 210 of these in China. Neal credited this success to Gulfstream’s early entry into China, introducing the first Gulfstream, a G200, to the market with a charter operator in the early 2000s. “We established a strong market following very early as the Chinese business aviation market was starting,” he said. It also has helped that China has been more of a large-cabin, long-range market, he said, “which was perfect for Gulfstream.” While that dynamic largely is the same, he does see the emergence of a preowned market in China as well now. Gulfstream was also the first to open its own service center in the region, with a facility in Beijing that has now serviced more than 1,000 aircraft. It also has served to build up the company's service network. While still a solid market, he said that activity in the Asia Pacific region “tempered” a bit last year. He does not believe the anti-corruption measures were as much a factor but does believe that the uncertainty associated with trade discussions may have been a factor. But Neal said that softening may be more temporary. “There's still enormous opportunity in the Asia Pacific region, especially in China,” he said. “We have maintained all of our investments there. We have not pulled back at all.” Neal added that he has even added to the sales team in the region.